Daikos Sunspar lounged in the sand. The sound of sea birds and the gentle lapping of waves mingled with the salty scent of the cool ocean breeze to create a calming effect that bordered on the surreal. The dreamlike nature of the moment was enhanced by the approach of a young Twi’lek woman. She was carrying a pair of frosted mugs with tiny, ridiculously festive umbrellas in them. She also appeared to be wearing naught but a smile and what amounted to, maybe, six square inches of shimmer silk. She advanced across the beach, hips swaying hypnotically, eyes narrowing seductively. “Can you walk?” she said. The incongruity of the question caught Daikos off guard. Walking was not one of the physical activities currently queing up for inspection in his mind. “Can you walk?” the voice, while still clearly female, had changed. It was less alluring, to be sure. It also had a muffled, slightly tinny quality. Almost like it was being filtered through …. He opened his eyes. A fiercely helmeted figure was standing over him. Ah, he thought, the Mandalorian. Well, it could be worse. A slightly battered medical droid elbowed its way forward and extended one skeletal, metallic arm. The tip of its index finger slid open with a deceptively innocent pop! Daikos barely managed to scuttle out of the way before a jet of flame belched through the space previously occupied by his head. “It was nearly a terminal one!” Daikos shouted. “Enough.” It wasn’t a shout. It was simply a statement of fact that hinted at any number of unpleasant futures for any who wished to challenge it. The Mandalorian insinuated herself in Daikos’ field of view again. He vaguely remembered her from the voyage. Tau, he thought, That’s her name. Or was it Fau? “Shot down.” Again…a simple statement of facts. The Empire! Of course. I remember the Star Destroyer coming out of hyperspace. “Now we need to get moving before they come looking for us.” Rhaine tossed him a blaster rifle. “Know how to use one of these?” she asked. “Yes.” But you already knew that, didn’t you? Otherwise you wouldn’t have given it to me. And you never asked my name. “Why are they coming for us?” he said cautiously. 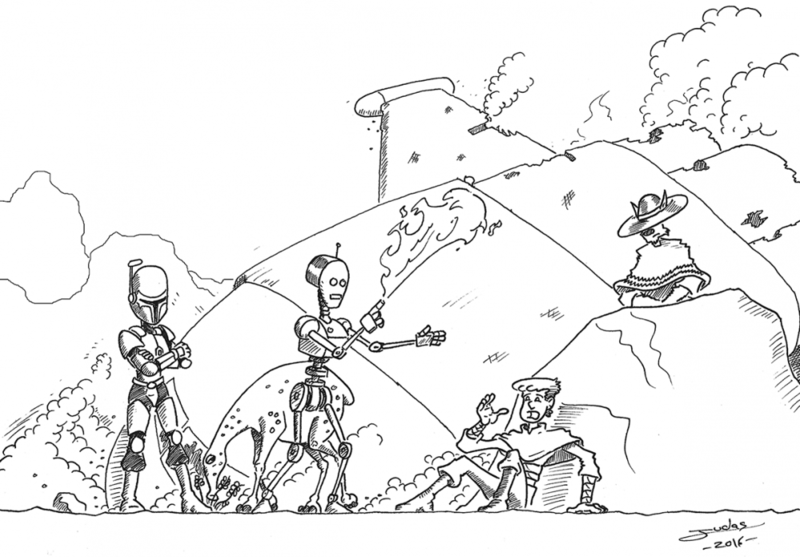 “What about ….that?” Daikos waved a hand at a nearby eopie. It was grazing unconcernedly on a withered patch of scrub. It had apparently been on the ship as well, and represented the last of the survivors. “It comes with us.” The note of finality in Rhaine’s voice as she began loading the animal with provisions quelled even the notion of argument. As they set out, putting the crash behind them, Daikos’ mind raced. Have they found me? No. I’ve been careful, right? Kept it low key. Well….there was that time on Correllia. And again on Ando Prime. And things did get pretty messy on Ord Mantel. Then there was that senator’s daughter and the missing code key. Still….they might not be after me. Yessssss I'll be hanging on for more!! I love it. Good job on this one.